Color(s): Seven different colors: chalk, cream, apricot, chocolate, café, black and silver. Chalk, cream and apricot/gold can have rose or black pigment. 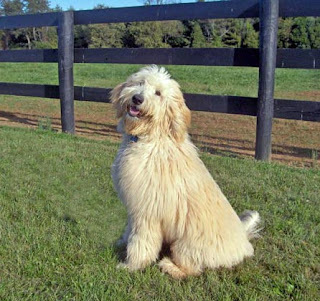 The Labradoodle is a cross between a Standard Poodle and Yellow or Black Labradors. Initially they were made for the purpose of company and presently it has become a favorite amongst the people for they make an amazing companion for everyone. They are very lively along with being instinctive and do well as a community dog if given the proper training. They have taken on the traits of both Labrador and Poodle. They are immensely popular owing to their affectionate, devoted and lively nature. Along with being a friendly companion, they also make a good guard dogs. Even though this breed gets along well with children if given proper training and socialization but their varying temperament is sure to cause issues in the future. Similarly they will get along well with other dogs and animals that they have been raised with but due to temperament change can become evil with small animals. The Labrador needs daily brushing in order to ensure a tangle free coat and has to be clipped once a year due to the fact that they shed little and at times no hair. The shedding of the dog depends upon the bloodline. It is a mixed breed and thus has no fixed standard but should have a wooly or curly coat and retain the traits of the Labrador along with the ability to shed little or no hair. Moreover, the muzzle area needs to be cleaned on a regular basis to get rid of the dirt. Labradoodle does extremely good in agility sports. The Labradoodle is very sharp and thus can be trained easily; however, the training methods should be changes as repetition bores this breed. The Labrador is easily trained to adjust to the household and takes active participation in different sports. They need exercise and thus should have a ground to play around in, loves walking and jogging with the owner. The dog must get at least two hours of exercise everyday because of being a large dog. Although Labradoodle is a healthy breed, living for about 13 to 15 years but some of them may suffer from hip dysplasia, progressive retinal atropy and Addisons disease.